Send Gorgeous Pink Rose Basket to Chennai. Gifts to Chennai. Send Flowers to Chennai. Description : Send these 50 Pink Roses decorated with green leaves presented in a basket to your loved one through Gift2Chennai.com and make them realise that you are crazy about him/her. With these, express those unsaid words, 'you mean the world to me'. 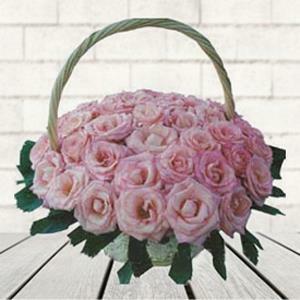 Send this pink roses basket to Chennai on any special occasion. You may also send Gifts to Chennai to your near and dear ones through us.